Donald Trump vows to "make America great again." 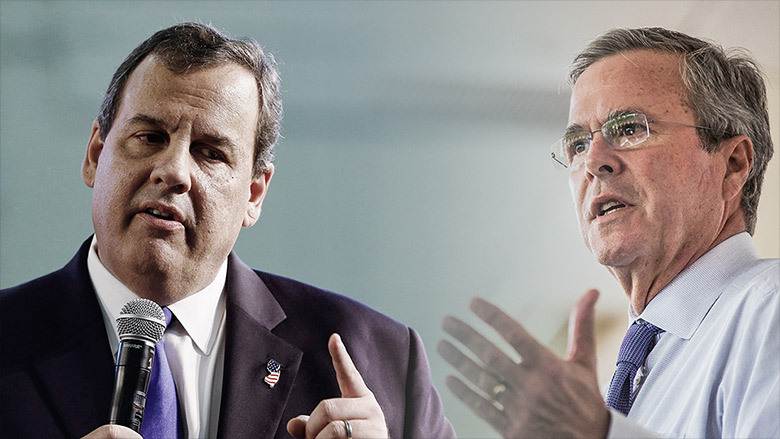 His rivals on the Republican ticket, Jeb Bush and Chris Christie, have gotten more specific, claiming they can grow the U.S. economy by 4% a year. Expect that figure to pop up again at the first Republican debate on Thursday. The country would need a turbocharge to rev up to that level. To find a period when the U.S. routinely grew at that pace you have to as far back as the 1950s and 1960s. More recently, the economy grew at 4% in 2000, right before the dot-com bubble burst. Lately, the economy has been expanding at just over 2% a year. It's one of the issues President Obama is criticized for -- creating a good, but not great, economic recovery. "There is not a reason in the world why we cannot grow at a rate of 4% a year," Bush said when he announced his run for president. Another golden era? While everyone wants to see better growth than what we have now, experts are skeptical about the return of 4% growth. "It's a very optimistic projection they are making," says Dan Sichel, a professor of economics at Wellesley College and a former forecaster at the Federal Reserve. Back in 2000, the economy grew at 4%, but that was largely because of the tech boom. That bubble soon burst and the U.S. went into a recession in 2001. While there are occasionally quarters or years when America hits that mark, the 1950s and 1960s saw sustained high growth as the U.S. expanded production after WWII and welcomed the Baby Boom generation into the workforce. Economists refer to that era as the "Golden Age" of economic growth. Working harder: So what would it take to get another great economic age? Politicians like to talk a lot about taxes, spending and regulation. Yet, it's more basic than that. You get higher growth when more people are employed and they are producing more. In short, you need more people working, and harder. In the 1960s, the U.S. saw the Baby Boomers begin to enter the workforce, a huge upswing in the labor force that propelled growth. The opposite is happening now: Baby Boomers are leaving the workforce, and no one is talking about a fertility boom these days. "Growth of 4%...would require an even more rapid increase in labor productivity (output per hour) than was realized in the Golden Age of U.S. economic growth," says Sichel. The next president going to have to rely on making America more productive. That's the reason Bush said "people need to work longer hours" on the campaign trail in July. It's not a great one-liner, but it might make some economic sense. The specifics: There's a long way to go on the campaign trail -- and many more policy details yet to emerge. Trump challenged his GOP competitors to lay out their job and business plans in a message on Facebook this week, although he himself has been thin on specifics, especially when it comes to the economy. Bush has talked broadly about reforming regulation and taxes and enacting a balanced budget amendment. Christie recently put out a 5-point plan to improve the economy. The factors include: lowering taxes, scaling back regulation, reforming energy (think: approving the Keystone XL pipeline and lifting the export ban on crude oil), making the R&D tax credit permanent and eliminate payroll taxes for those under 25 and over 62. So far, it's hard to make anyone's math add up to 4%. "(It's) pretty aspirational," says Kevin Hassett, director of economic policy at the American Enterprise Institute who has advised many Republican presidential candidates, including George W. Bush. His research finds that tax and budget reforms could "be a big part of the calculus" of boosting growth. "Anyone promising 4% growth would be a mistake," says Hassett. "But it's not impossible."